What a gorgeous card Sylvie love the background you've created with those stamps - just lovely - how clever! Also love both your entries so far for this weeks LIM challenge. I've not made a start on mine yet! Enjoy rest of your weekend and catch up in the week. Your card is beautiful and I love the backing paper. Thanks for taking part in this weeks CES Challenge! Love your gorgeous blue card Sylvie. Absolutely stunning card and your stamping is sensational! Love it! Beautiful card - that background is really gorgeous. Welcome to your first CES Challenge, good luck and I hope you will join us again. Hi Sylvie, wow such a fabulous card but then its made by a fabulous lady so it will be. I love your stamped background...the colours are gorgeous! A really fabulous card! Very pretty card Sylvie just love these colours together. 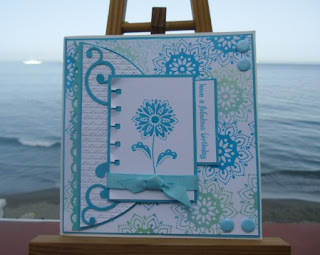 A beautiful card Sylvie - your backing paper is fabulous and I love the swirls and shades of blue. Wow! this is stunning Sylvie! Love the layout and papers. Gorgeous Card! Hi sweetie oh wow this is something, its soooo beautiful.....WOW!!!! Thank you so much for joining us girlies over at CES Challenges, good luck sweetie. the colours and design of this card are fab!